Please note – we cannot write one letter to multiple children, only one child per letter else the letter will not make sense. Also, if you are ordering multiple letters, please add one letter to the shopping cart at one time, fill in the form for that specific child, checkout and pay. You will then be returned to the website to repeat the process for the next child. 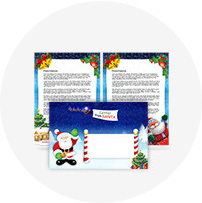 Get a personalised letter from Santa by email. 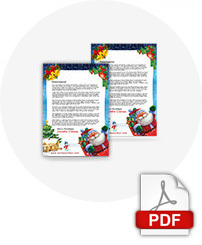 Santa will write 2 personalised letters for your child authentic Santa letterhead (as shown in the image above) and send them to you in PDF format for you to print out on your own colour printer. The first letter will be early on telling them they have been good and are on Santa's good list and details Santa knows them (based on what information you provide). The second letter will be just before Christmas day telling them he's about to leave the North Pole and is due to visit their house soon with presents! Both letters will be personalised to the relevant child. We save on material and packaging costs and pass those savings on to you. 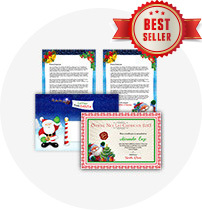 Same as Package 1, except the letters are physically printed on Santa letterhead and send in our magical Santa illustrated envelopes. The joy on your child's face when these envelopes pop through the letterbox would be one you will want to capture and keep forever. Same as Package 2 and also includes a beautiful Good List Certificate from Santa himself. Printed on thick parchment card, this certificate is good enough to frame! 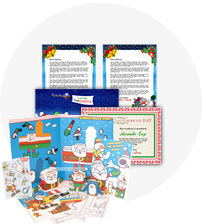 Same as Package 3 & includes a Santa Activity Pack too. The activity pack is suitable for children aged between 3 & 5.